My Geeky Goodies is currently on a monthly sub hiatus. However, they are still doing Monthly Mashups with hints give out each day they are selling. You have to buy fast, though as these do sell out. 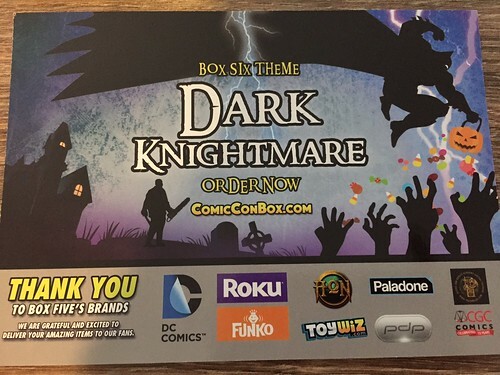 These are one-time boxes, not a subscription. 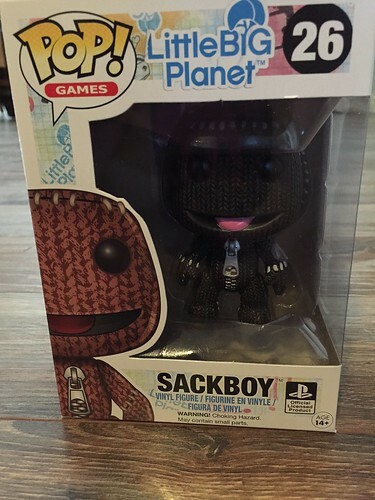 Sackboy Funko POP! 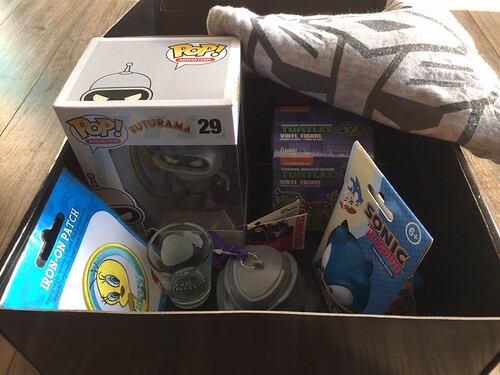 (Retail $8.95 on Amazon) – I love and collect Funko toys, but I’m not a gamer – so I’ve never heard of Sockboy or Little Big Planet. So, this was a disappointment for me. Robin Funko Mopeez Plush (Retail $9.88) – This is my first Mopeez, and it’s Robin – so yay! 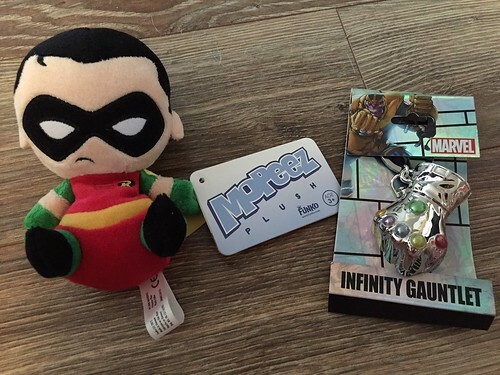 Infinity Gauntlet Keychain (Retail $7.36 – originally $9.99) – Move over Thanos, I have the power now. This (pewter) keychain is HEAVY, so I wont be using it on my regular batch of keys. But if there’s a key I don’t use daily, that I don’t want to lose – this is the keychain to use! Or it’ll probably just go on my shelf of fun Marvel props. 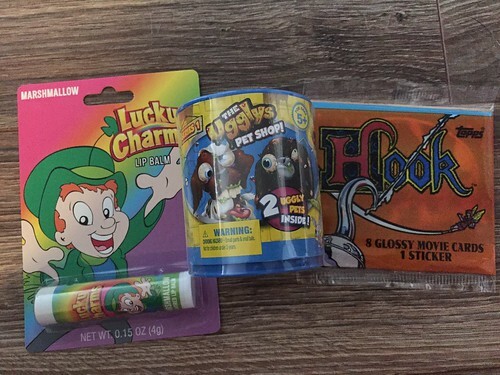 Lucky Charms Lip Balm (Retail $4.62) – This will go in a child’s Christmas stocking. The Ugglys Pet Shop Toy Figure 2-Pack (Retail $4.15) – This will probably go in a White Elephant gift exchange. Hook Trading Cards (Retail$2.99) – These are so dated, I don’t know of anyone who’d want these. 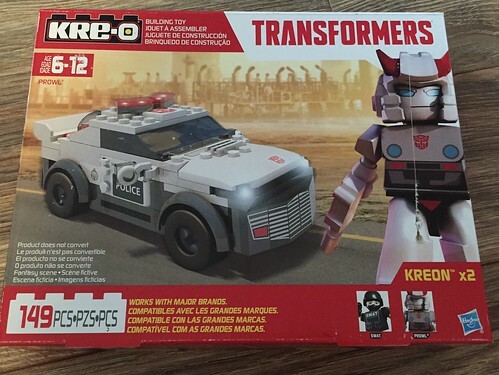 Transformers KRE-O Prowl Police Car Set (Retail $8.99) – KRE-O sets are usually cheaper than LEGO, but just as fun to assemble. If I don’t keep this, it’ll be loved by my Transformers-loving nephew. Summary: While a great value, there wasn’t enough here for me to try it again until the subscriptions come back – if there’s an interesting theme. What do you thinks of My Geeky Goodies? 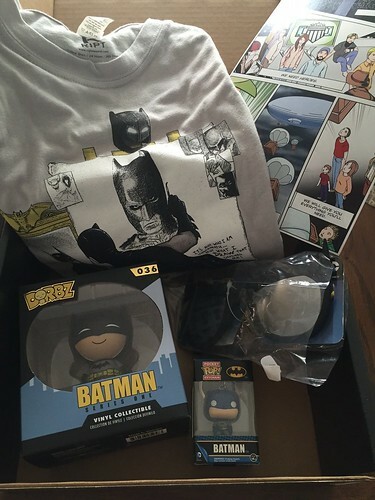 The Hero Crate monthly subscription is $29.99/month. Cheaper, if you buy more than one month at a time. 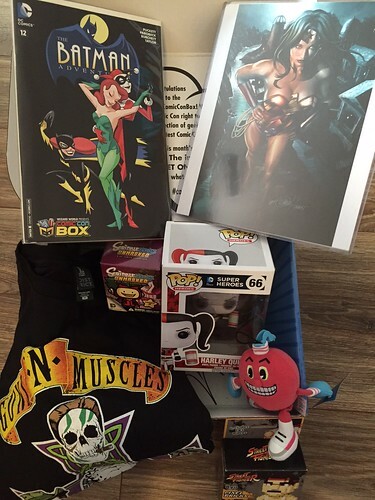 I received this August Anniversary box from Hero Crate for review. The theme for August was Batman! 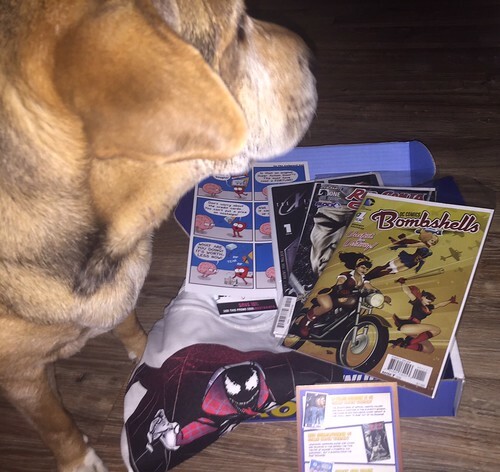 Included, was a HeroCrate comic that went along with the theme (in the upper right hand corner of the pic above. 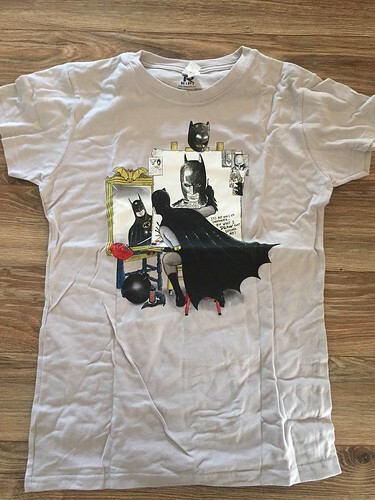 Batman Tshirt (Retail $10?) – These are juniors sizes for women, and run very small. So order a size or 2 larger. 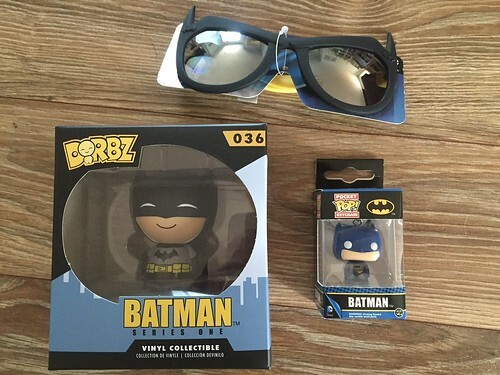 Funko Dorbz Batman (Retail $7.91) – These Dorbz are super-cute, and I don’t have Batman yet. So, yay! Funko POP! Batman Keychain (Retail $6.17) – Another Funko item – always a fun item to get. Batman Mirrored Sunglasses (Retail $12.99) – My nephew will love these. Nice stocking stuffer for Christmas! Summary: The value seems just above the monthly price. And this box only came with 3 items instead of “4-6” as described. But they’re probably higher value than the smaller items that are often included. I love that this box focuses just on heroes. I will probably check out future boxes. 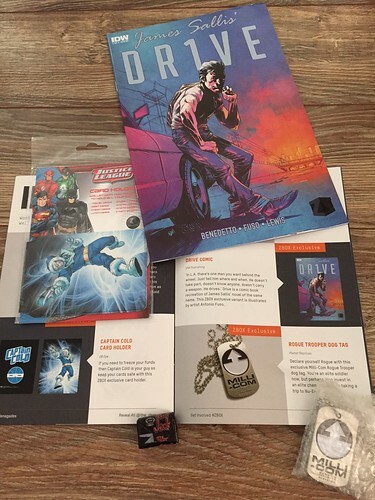 What do you think of Hero Crate? The theme of this box was Hyperspace. 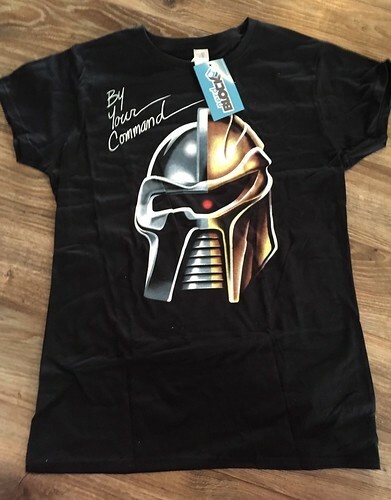 By Your Command Tshirt (Retail $10?) – This is an exclusive shirt via Shirtpunch.com. It’s a fun design. And I’m happy they included the original BSG Cylon, as I’m a big fan – but not of the reboot. Something for all fans! 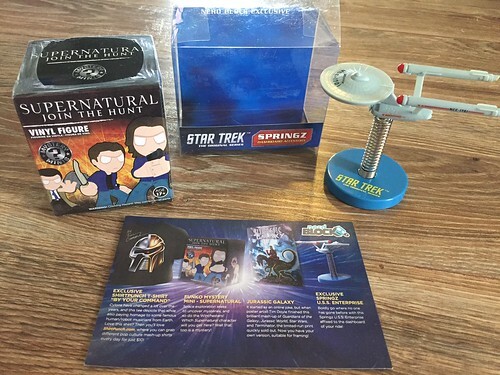 Supernatural Funko Mystery Mini (Retail $8.31) – It’s no mystery that I love Funko figurines. USS Enterprise Springz (Retail $3-5?) – This is another exclusive. This Original series Star Trek ship has a permanent sticker on the bottom to mount to your car dash. I don’t like putting something permanent on my dash, but I LOVE this ship. So I’ll either just cut out a smaller part of the sticker or keep it on my Star Trek bookshelf with the other memorabilia. 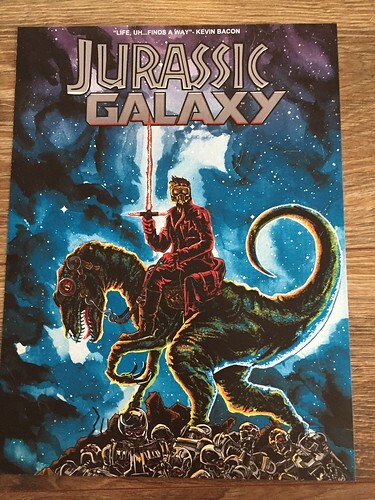 Jurassic Galaxy Print (Retail n/a) – This is a really fun print for Chris Pratt fans – with a Jurassic Park/Guardians of the Galaxy mashup! My only complaint is that it’s on cheap matt, cardboard and not in a protective sleeve. 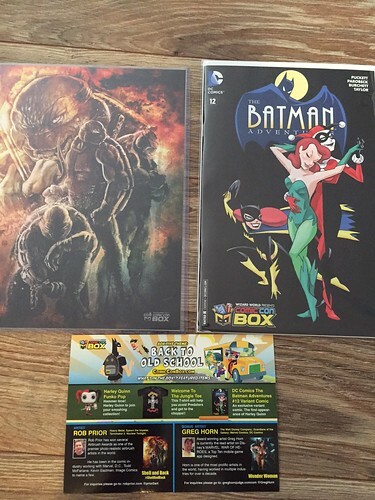 The Comic Con box does a great job with it’s prints. 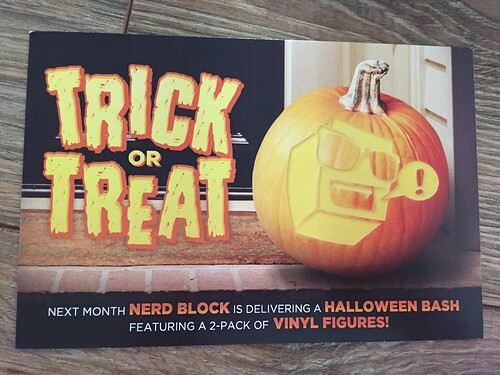 I wish Nerd Block would do better or not include them at all. 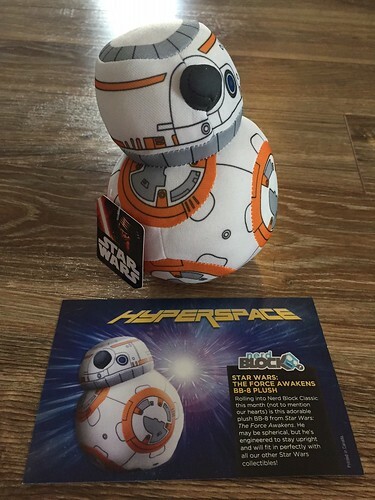 BB-8 Plush from Star Wars: The Force Awakens! (Retail $9.96) – This super cute droid is the one I’ve been looking for. It’s plush so the spherical design doesn’t want to stay upright, despite the beads at the bottom weighing it down. But I don’t care. I just propped it up against something else. Love it. 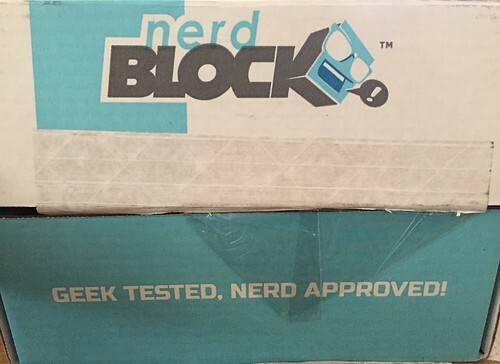 Summary: Nerd Block had another great box for me this month. I was very happy. Despite several exclusive items, it’s easy to see that the value is very comparable to what was spent. And exclusive items are great. 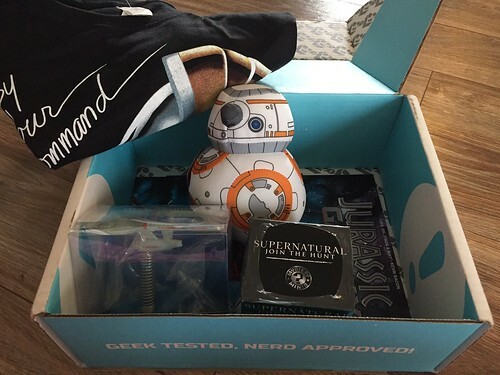 I’m most excited about the shirt and BB-8 plush – this made the whole box worthwhile. And October will be a Halloween theme… shocker! Shell and Back Print (Retail n/a – exclusive) – This print from Rob Prior is excellent. As a Turtles fan, I’ll be holding onto this. Batman Adventures #12 Variant Comic (Retail $? – I don’t see it listed online anywhere) – The reason this wasn’t #1? It’s the first appearance of Harley Quinn. Very cool. 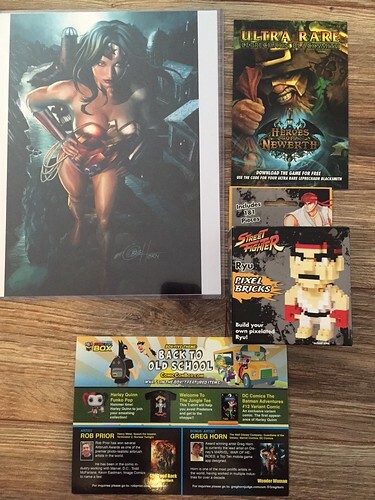 Wonder Woman Print (Retail n/a) – Wow, this artwork is incredible. This is by far my favorite item in this month’s box. Heroes of Newerth Game Download with Avatar – Not a gamer, so not for me. Street Fighter Pixel Bricks (Retail $12.99) – I’m not a Street Fighter fan, but I love building things with legos and bricks, so I haven’t decided if I’m keeping this to pass along to my nephew or not. Pac-Man Mini Plush (Retail $9-10) – I appreciate Pac Man for being Old School, but don’t really care to own a plushy. Looks like Lois Lane may get another dog toy. 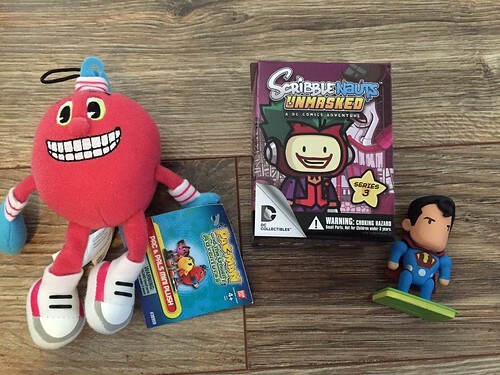 Scribblenauts Unmasked Series 3 Blind Box Mini Figure (Retail $6.44 on Amazon) – I received Superman which is very appropriate. Funko Pop! 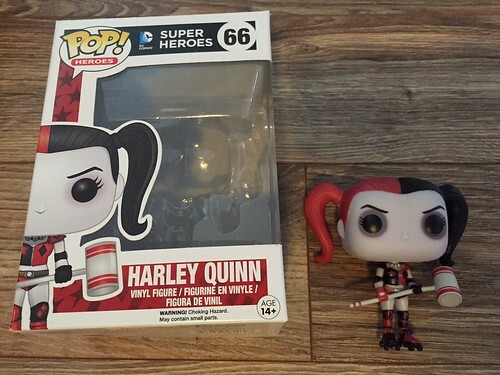 Harley Quinn (Retail $9.99) – This is the cute, Roller Derby version. I’m always excited to add to my Pop! collection, if it’s DC or Marvel. And I don’t have this one yet. 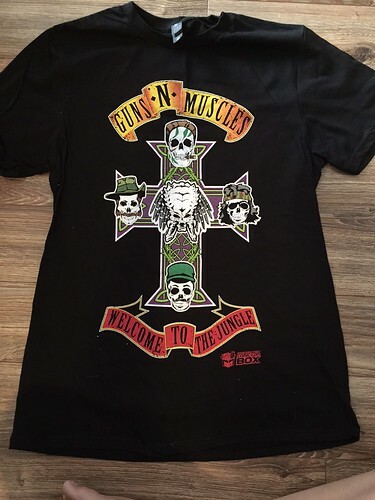 Welcome to the Jungle Tee (Retail $10?) – This is a fun Guns N’ Roses mashup with 80s action stars. But the style isn’t something I’d ever wear. 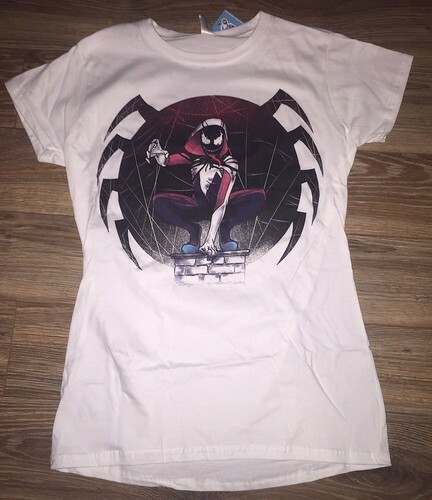 Summary: Despite not caring for the shirt or the smaller items, I surprisingly liked the prints (which has never happened yet) and the Funko Pop!. So this was still a great box for me. 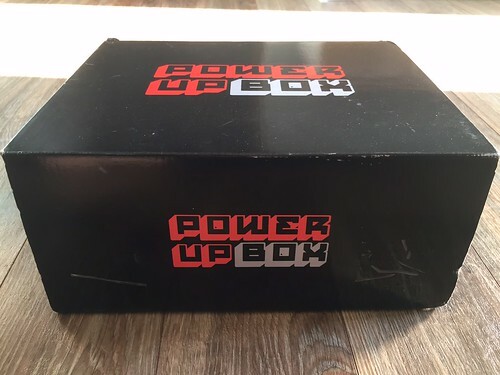 Power Up Box has two subscription box options: Deluxe (4-6 items) for $19.95 plus s/h per month or Premium (6-9 items) for $29.95 plus s/h per month. I received August’s box for review. The theme seemed to be Animation. 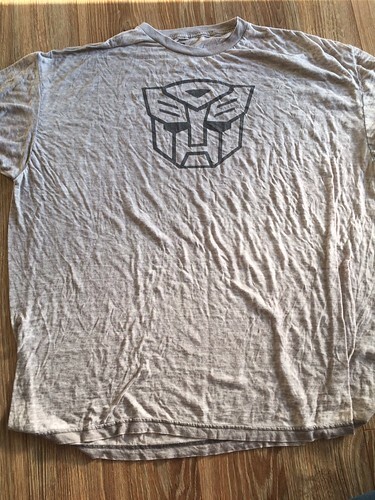 Transformers Tshirt (Retail $10?) – Since this was a review box, all they had left was XXL, so it’s quite big. Subscribers will get the size they request. Even though this is huge, I love it. It’s a very soft vintage look and feel. Plus, I love Transformers. It’s a bummer that they didn’t have my size, but it’ll be a nice sleep shirt! 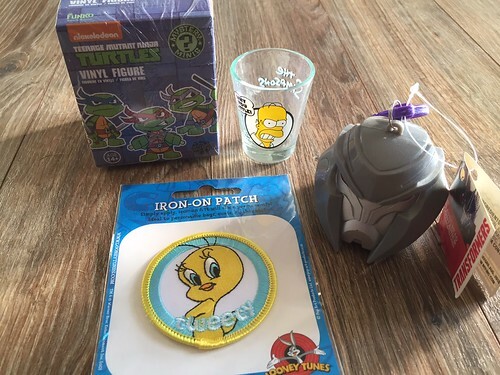 TMNT Mystery Mini (Retail $6.99) – I’m a Turtles fan and love Funko mystery boxes. These are almost always a win for me. The Simpsons Shot Glass (Retail $3.75) – I hate the Simpsons, but this is just a filler item. And it does fit the theme. Tweety Iron-On Patch (Retail $3.99) – I quit collecting patches in middle school, but I have niece who will love this. Transformers Plastic Head Candy Container (Retail $1?) – My nephew loves Transformers (of course). This will be a nice treat for him. 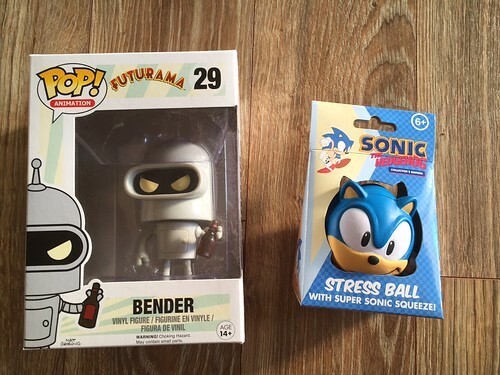 Futurama Bender Funko POP! (Retail $11.80 on Amazon currently) – Usually, I love Funko items, especially POPs! But I’m not a fan of Futurama, so this may be the only Funko POP that I don’t keep around. Sonic Stress Ball (Retail $8.99) – The kids in my life love Sonic, tho don’t really have any stress in their lives yet. Still, this will be a cute toy for one of them. 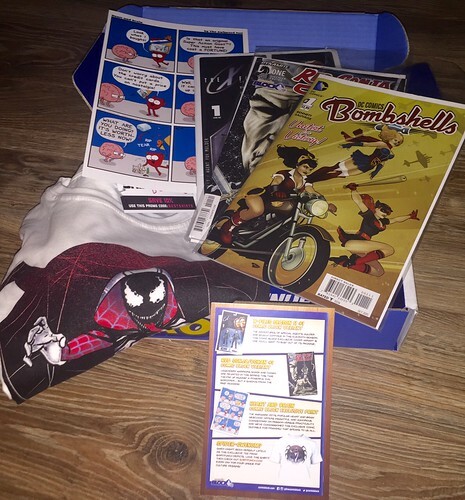 Summary: The value is certainly worth the cost of this fun subscription box. Even though the theme wasn’t geared toward me, I’ll still keep a couple things and give the rest to the young ones in my life. 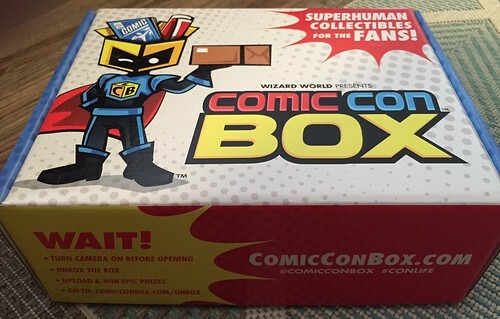 I’m impressed with the value, for being one of the cheaper geeky boxes out there! September’s theme is PIXELS, so that will be another fun box for youngsters and the young at heart! 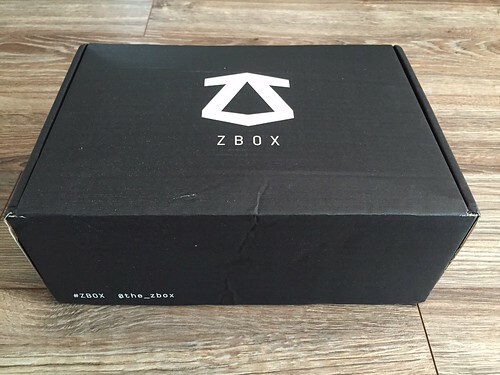 The ZBOX starts at $31.18/month. The theme for August was Renegades. Each box comes with a nice mini magazine. 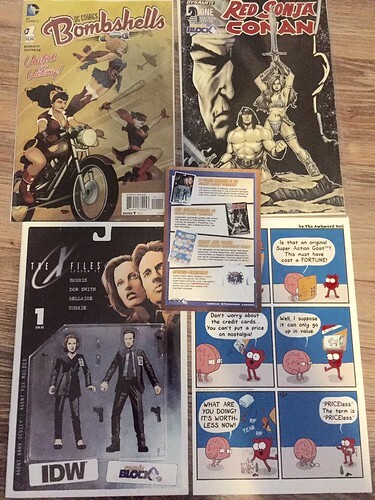 James Sallis’ Drive Comic (Retail $3.99) – This is a variant. I prefer superhero comics, so this really didn’t do anything for me. Rogue Trooper Dog Tag (Retail $1?) – Guessing this has to do with a game, as it’s not at all familiar. 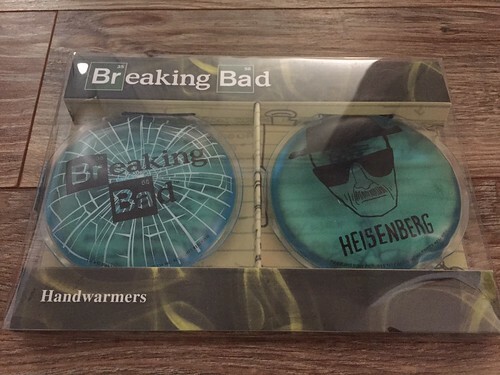 Captain Cold Card Holder (Retail $1?) – Are there that many fans of Captain Cold? This was another filler wasted on me. There was also a little piece of candy that was tossed in that I’ll give to my niece. 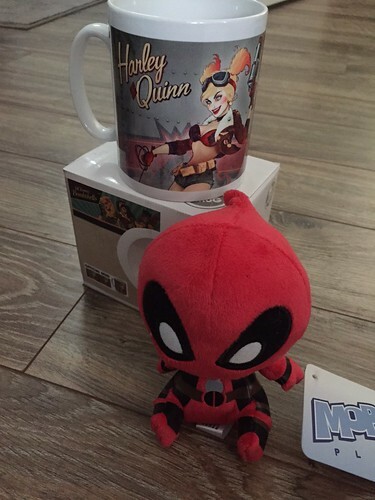 Harley Quinn Mug (Retail $10?) – The style is from DC’s Bombshells series. So, again, this was a total miss for me. Deadpool Mopeez (Retail $9.99) – The only thing I’m keeping from the box. It’s cute (from Funko) and it’s Deadpool. Summary: The value barely surpassed the cost this month. 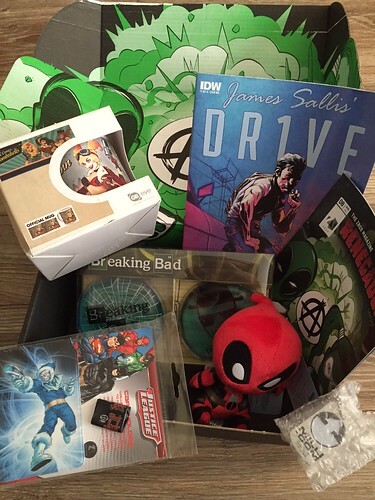 I wasn’t really impressed, even if I had liked anything besides the Deadpool stuffed toy. I may try another box in the future, if the theme interests me. 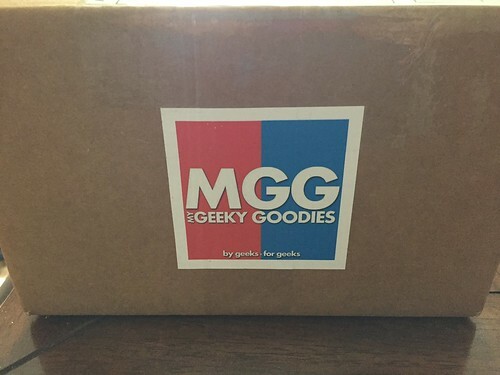 Smugglers Bounty: New Star Wars Subscription Box! If you subscribe to the Marvel Collector Corps or are a big Star Wars fan, you may have already heard that this is coming. I had heard this was coming as well as a DC Comics version sometime this fall. This one isn’t shipping until November. But you can order now! From Funk Marketing: Star Wars.com and Funko are proud to unveil Smuggler’s Bounty, the only OFFICIAL Star Wars subscription box in the galaxy! Featuring 100% exclusive collectibles, apparel and accessories from the Star Wars universe, the debut box – entitled Star Wars: The Force Awakens – will ship this November. For just $25 every other month, members will receive a box full of exclusive Star Wars-themed Funko items valued at over $50. Each box will focus on a different part of the Star Wars universe and include memorabilia exclusive to the program. The initial November box will contain TWO exclusive Pop! vinyl bobbleheads from the upcoming film Star Wars: The Force Awakens, as well as a host of other surprises perfect for any Star Wars fan. 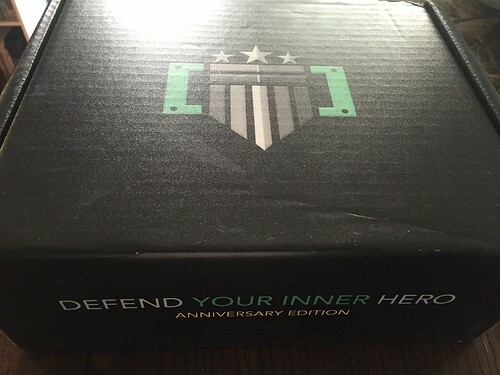 Boxes will ship every two months, and there are two member levels available – a monthly plan (Pirate), and an annual plan (Boss) featuring a mystery reward upon completing one year in the program. Don’t miss this chance to get in early and acquire the premiere box from Smuggler’s Bounty – Star Wars: The Force Awakens. Sign-up today at www.smugglersbounty.com!